This weekend, former FIFA International Referee and PRO’s Manager of Development Group, Michael Kennedy, was announced as one of 10 new inductees to the Illinois State Soccer Association’s Hall of Fame. Kennedy becomes the third former official in PRO’s support team — after Sandra Serafini and Greg Barkey — to be included in their respective state’s hall of fame since the 2018 regular season concluded. Established in 1983, the ISSA’s Hall of Fame recognizes the “extraordinary people in our soccer community” and Kennedy’s contribution to refereeing was acknowledged in a banquet celebration on January 27, at the Schwaben Center in Chicago, Illinois. 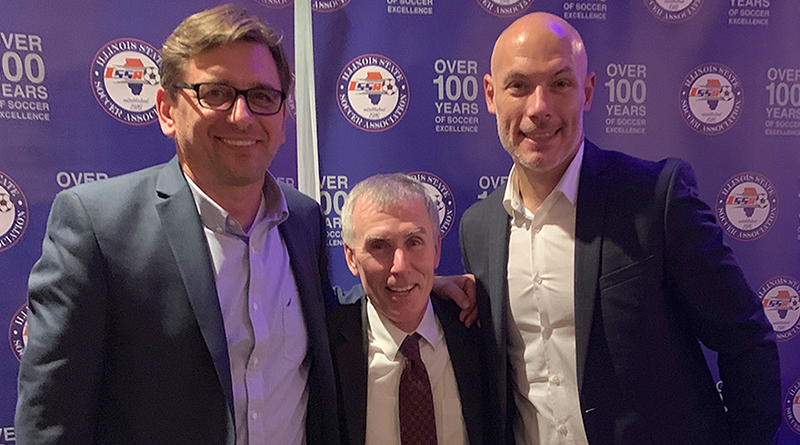 PRO GM Howard Webb and PRO Director of Development Match Officials Alex Prus were in attendance as the 2004 MLS Cup and MLS All-Star referee received the plaudits for his long career in officiating. Part of the pool of National Referees who took charge of the inaugural MLS season in 1996, Kennedy was also fourth official for the 2002 MLS Cup, 2007 MLS All-Star and 2010 MLS All-Star, as well as the referee for the 2010 Lamar Hunt US Open Cup Final, before retiring in 2012 and joining PRO’s coaching team the following year.